VENTURA — Plans to redevelop an iconic restaurant on San Diego Bay with a larger dining-themed project can be reviewed by the California Coastal Commission, according to a March 8 vote by commissioners in Ventura. Whether the Coastal Commission has authority to review restaurant projects was the central question of a dispute resolution between the state agency and the Unified Port District of San Diego. Commissioners, in a 9-1 vote, determined they do have authority to appeal or review restaurant projects. The Brigantine currently proposes building a large dining-themed project on San Diego Bay. Boaters would have a dock-and-dine option at the proposed Portside Pier complex, according to plans. Port of San Diego representatives argued the Coastal Commission couldn’t appeal or dispute restaurant developments within the five-city district’s jurisdiction. The Coastal Commission, conversely, worried whether being precluded from appealing The Brigantine’s Portside Pier project would prevent the agency from reviewing similar development in the future. There are as many as 60 restaurant developments on tap within the port district, according to Coastal Commission staff. Rebecca Harrington, a member of the port district’s legal counsel, alleged the Coastal Commission failed to follow due process. She added the port district is not a local government but instead its own entity. The Coastal Commission’s authority to appeal or dispute projects like Portside Pier only applies to city and county governments, not port districts, Harrington added. There are 11 existing dock-and-dines in the Port of San Diego, all of which are non-appealable, according to Harrington. “You don’t have the inherent authority, as an administrative agency, to create proceedings that aren’t otherwise in the Coastal Act or your regulations,” Kauffman told commissioners. Coastal Commission members and staff both stated the Portside Pier proposal has a few issues in need of resolution. Counsel for the Coastal Commission added the state agency would still have the authority to address and review its concerns of the Portside Pier project at a later date, regardless of whether the March 8 dispute resolution was held (or even necessary). One such issue was the project’s increase of water coverage. Increases in water coverage are generally reserved for projects where coastal-dependent use is the predominant theme. The only coastal-dependent use element of the Portside Pier plan is the dock-and-dine proposal. Coastal Commission staff stated the dock-and-dine element is not a dominant theme or use of the Portside Pier proposal. The Coastal Commission also challenged the project’s parking plans and signage. Commissioner Greg Cox, who was the sole vote against the prevailing motion, said although he’d like to see The Brigantine’s proposal to come to reality, there are still issues the commission and port district still need to resolve. Commissioners were originally scheduled to vote on an appeal of The Brigantine’s proposal. However the appeal was postponed after commission staff and port district did not see eye-to-eye on whether the state agency could review the project at this time. The Coastal Commission could revisit the appeal as early as May, when the quasi-judicial state agency meets in San Diego. 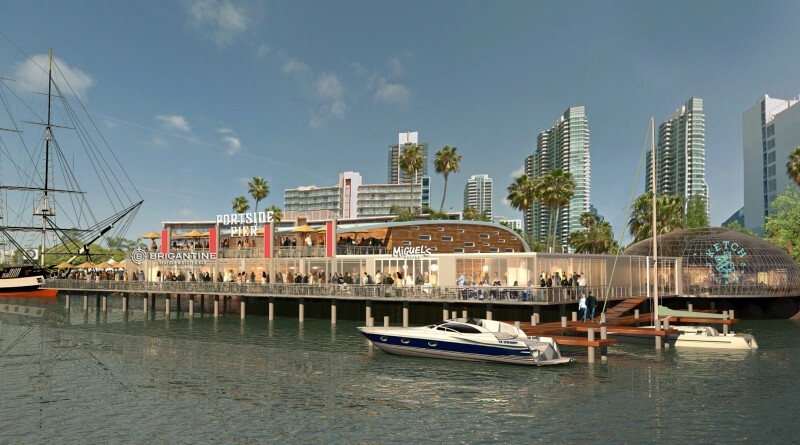 Conceptual plans to replace Anthony’s Fish, a longstanding restaurant in Downtown San Diego, with a new restaurant plaza known as Portside Pier were approved by the Port of San Diego’s Board of Port Commissioners in December 2016. Anthony’s first opened its doors in 1946; the restaurant officially closed its doors on Jan. 31. The Brigantine beat out five other proposals to redevelop the waterfront property. Current plans call for Portside Pier to replace the current Anthony’s structure on the eastern bay with new restaurants, dock-and-dine opportunities for boaters and a public viewing dock. Portside Pier would be a two-story restaurant redevelopment featuring four dining concepts and three public access amenities. A dock-and-dine feature would be able to accommodate up to 12 vessels. The Coastal Commission met March 8 and 9 in Ventura.